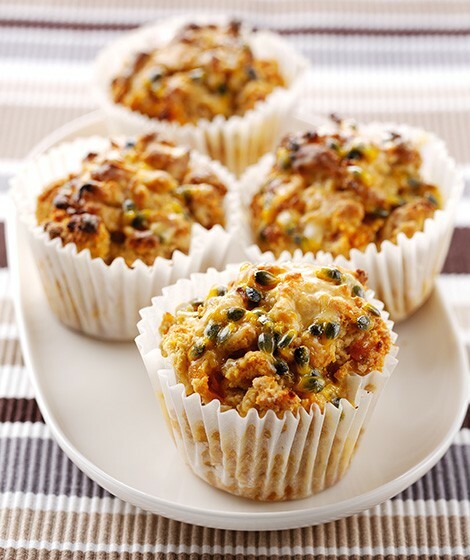 Flavoured with mangoes and fresh fruit juice, these muffins are naturally sweet and need no added sugar - just a little in the passionfruit glaze. Line a 12 section muffin tray with paper muffin cases. Put the mango pieces and 200ml (7fl oz) of the fruit juice in a saucepan. Heat until the juice bubbles around the edges then reduce the heat, cover and cook gently for 5 minutes. Leave to cool. Blend the mango and juice in a food processor or blender until pureed but with some pieces of fruit remaining. Turn into a bowl and beat in the egg, butter and remaining juice. Sift the flour and baking powder into a bowl, tipping in the grains left in the sieve. Add the mango mixture and stir gently with a large metal spoon until only just combined. Divide among the paper cases and bake for about 15 minutes until risen and golden. Transfer to a wire rack and leave to cool for 15 minutes. Halve the passionfruit and scoop the pulp into a small bowl. Add the icing sugar and stir until mixed. Drizzle the icing over the muffins and serve warm or cold. Like most muffin recipes, these are best served on the day they're made. Any uneaten muffins will freeze well, preferably un-iced, for a later date. You could always make a half-quantity of icing and glaze half the muffins. Remove them from the freezer as they're required, heating through in a moderate oven until warmed.